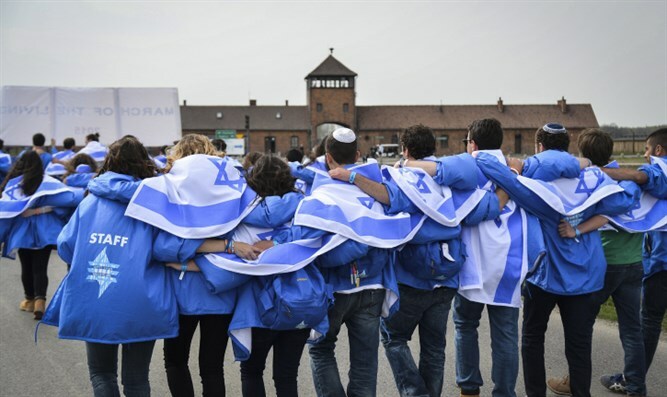 MainAll NewsInside IsraelCould Israeli guides at Auschwitz be arrested under new law? Could Israeli guides at Auschwitz be arrested under new law? Israeli tour guides worry that new law will cause them to be imprisoned for discussing Polish involvement in Holocaust. Israeli tour guides have expressed concern that a new Polish bill barring citizens and foreign nationals alike from discussing Polish involvement in the Holocaust, or referring to Nazi concentration camps built in Poland as "Polish" could land them in jail. The proposed bill, which has already passed the Polish legislature's lower house, would apply both in and out of Poland, and would sentence those mentioning Polish complicity in the Holocaust or use of the phrase "Polish death camps" to three years in prison. Proponents of the bill note that the concentration camps built in Poland were constructed and run by the Nazi German regime after they conquered the country in 1939, while omitting the cooperation of Poles, a string of pogroms during and just after the Holocaust, and the looting of Jewish possessions in Poland. The new legislation caused consternation among Israeli tour guides who specialize in Holocaust education. According to Haaretz, Gil Paran, who represents a group of tour guides, penned a letter to Education Minister Naftali Bennett (Jewish Home) inquiring whether the group he represents are exposed to criminal proceedings when bringing groups to Polish Holocaust sites such as the Auschwitz-Birkenau and Sobibor extermination camps. "We want to know whether mentioning the role of the Polish people in Holocaust is a violation of the law and whether an Israeli guide is exposed to legal action," Paran wrote and mentioned that the tour guides he represents frequently invoke Poland's role in operating the death camps. Paran told Haaretz that the wording of the bill is extremely loose with unclear definitions, causing guides to fear inadvertently running afoul of the law. "Is instruction considered a public statement that the law forbids? Can attributing guilt to a single Pole be misconstrued as blaming the entire Polish nations?" Paran wondered. Paran said that he has not yet received an answer from the Education Ministry but said that he and his fellow guides needed to know whether to expunge parts of its training course that would be problematic under the new law. News of the new bill had caused almost unanimous blanket condemnations from across Israel's political spectrum. Prime Minister Binyamin Netanyahu criticized the bill, calling the law "baseless. I strongly oppose it. One cannot change history and the Holocaust cannot be denied. I have instructed the Israeli Ambassador to Poland to meet with the Polish Prime Minister this evening and express to him my strong position against the law," he added. The Foreign Ministry summoned Poland's envoy to Israel on Sunday and called the new legislation "surprising and unfortunate". In addition, Education Minister Naftali Bennett told Arutz Sheva that he "instructed that the Israeli education system invest two extra hours to learning about the involvement of various European nations in the Holocaust. The truth is that many nations, including the Poles, were engaged in helping the Nazis murder Jews and in murdering Jews themselves."